JUDY GOLDMAN is the author of two award-winning poetry collections and two novels, Early Leaving and The Slow Way Back, which was a finalist for SIBA's Novel of the Year and winner of the Sir Walter Raleigh Fiction Award and the Mary Ruffin Poole Award for First Fiction. Her memoir, Losing My Sister, was a finalist for both SIBA's Memoir of the Year and ForeWord Review's Memoir of the Year. Her work has appeared in Real Simple, The Washington Post, and in many literary journals. She teaches writing workshops throughout the Southeast, and serves on the permanent faculty of Table Rock Writers Workshop. Born and raised in Rock Hill, South Carolina, Goldman has lived in Charlotte, North Carolina, for many years. She and her husband have two children and four grandchildren. 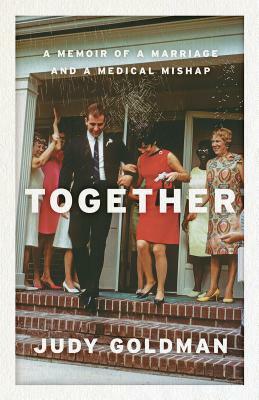 "Together is a riveting account of a strong marriage tested when a routine medical procedure goes terribly wrong. Judy Goldman beautifully shows us the challenges and setbacks but also the triumphs as two people find strengths within themselves to create a new life together." "Part love story, part medical mystery, Together explores the rich terrain of a marriage during a period fraught with uncertainty and stress . . . a celebration of what truly matters in life: the power of love, the importance of forgiveness, and the necessity of accepting that some things remain unknowable." "Judy Goldman is that rare writer whose inward gaze forces her reader to gaze inward as well, revealing something both brutal and beautiful about the world in which we live. . . .I loved this book. I really loved this book." "In Together, Judy Goldman explores the many paths--both bumpy and blissful--that a happy marriage navigates over many years. Although a medical mishap sends Goldman on this exploration, ultimately she lays bare not illness but strength: strength of character and family and endurance and, mostly, love." "Together . . . is part portrait of a 40-year marriage and part indictment of our medical system. Goldman's beautiful, deeply honest book is for anyone who has faced down change." "An insightful, at times harrowing, chronicle of the ups and downs of marriage, and the many roles we play in one another’s lives." "Together is a story about love, provocation and the nuance of blame." "Together . . . is a book you’ll read in one sitting. It’s that compelling, that illuminating. It’s a book that could make you see your own marriage in a whole new light." "With her journals in hand and her poet’s eye, Goldman records the emotional and psychological weariness of prolonged illness. But, above all, this is an inspiring story of how life can change in an instant and how the power of love and the support of friends and family helps through unspeakable challenges." "It seems like the blueprint for a strong marriage. Goldman fights the good fight for her husband, and, in the process, discovers new facets of herself. This is the memoir's strength. At its heart, it’s about a couple. Yet it’s also about a woman who changes in order to be a better partner when calamity strikes." "Somehow, Judy Goldman wrapped the story of a medical mistake into a beautiful memoir about her marriage and how love can change you . . . Finish the last few pages. Sit quietly for a while. Let the wisdom wash over you." "Together is a blueprint for coping with 'mishaps.' Goldman skillfully articulates the communality of human experience, and she’s startlingly frank when relating the difficulties a patient advocate encounters. . . Together is about being married, about becoming a part of another person and building on the long-term relationship we enter into when we take our marriage vows." "Please read Judy Goldman’s Together. This memoir is funny and heartbreaking. It’s about a role-reversing love founded on grit and determination, true as a heart-aimed arrow." "Goldman’s Together is a beautiful, haunting portrayal of young love growing into old love despite the unexpected and stunningly swift changes life’s inevitable forward momentum can bring. This exquisite memoir doesn’t shy away from the hard truths of marriage; rather it confirms that marriage can mellow into something different, deeper, and far greater than young lovers ever imagine, despite crushing heartbreak along the journey." "Anyone who has found themselves unexpectedly immersed in a loved one’s battle to survive with all its complications and trials will find Judy not just an engaging writer, but an indispensable companion in the struggle. Together touched me with its humanity and honesty." "Deeply moving and poignant, delicate and powerful, Together is a memoir about love and loss, acceptance and resilience."